1970 Picture Frame. 45th Gift . In 1969 there were 400,000 at Woodstock but 1970 saw an even larger crowd, 600,000, on the Isle of Wight including some of the Largest names in music that included The Who and Jimi Hendrix. This picture frame makes a great 45th anniversary frame for your special couple and see who else was married in 1970 and might want one: Nancy Sinatra and Hugh Lambert, Dennis Hopper and Michelle Phillips, Bob Crane and Sigrid Valdis, Mia Farrow and Andre Previn, Billy Crystal and Janice Goldfinger, David Bowie and Angela Bowie, Regis Philbin and Joy Philbin. This picture frame also makes an equally great 45th birthday gift frame. See who else shares their birthday in 1970: Queen Latifah (singer / actress - What Happens in Vegas, Hairspray), Mariah Carey (singer), Andre Agassi (tennis player), Tina Fey (comedienne - great Sarah Palin impersonator), Kelly Ripa (actress / talk show host - Cheaper By The Dozen), Matt Damon (actor - The Bourne Identity movies). 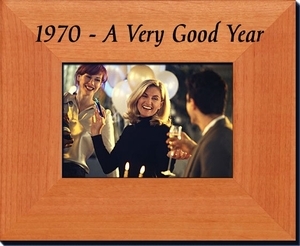 This photo frame says "1970 - A Very Good Year". This alderwood photo frame will fit a 3.5"x5" picture. See also our other 45th presents.